estled on the first floor inside of the elegant Omni Hotel San Antonio at the Colonnade, visitors will find a little spa serving up big hospitality. Travelers and locals alike enjoy a selection of massages and facials delivered by a highly educated staff. They offer in-room and pool-side massages to hotel guests and local residents, expanding well beyond the treatment rooms. The location within the hotel is excellent. The indoor poolroom and fitness rooms are a few yards away, and the outdoor pool with its cabanas for pool-side massage are just outside. Large glass windows allow natural light to stream in on the reception area of the spa as well as into the indoor poolroom and fitness room. 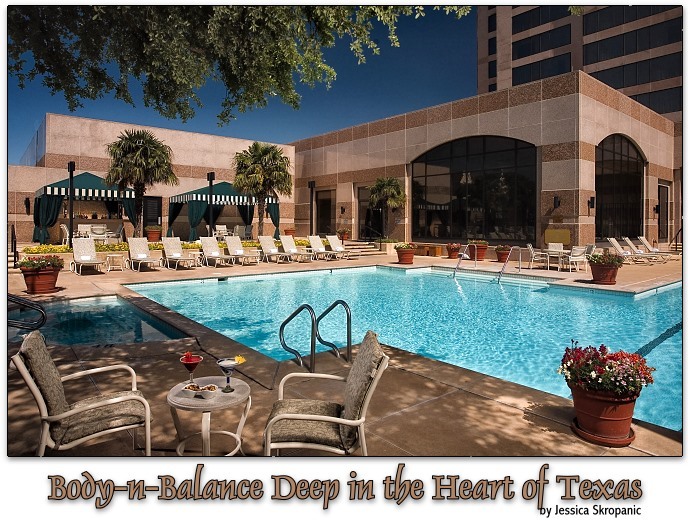 The San Antonio location is the second one for Body-n-Balance owners Monique and Loyd Wellesley, the first being the Omni, Corpus Christi. (See www.spareviewmag.com/13/bnbomni.html). Their mission statement and mantra is to “exceed all expectations.” And they do. 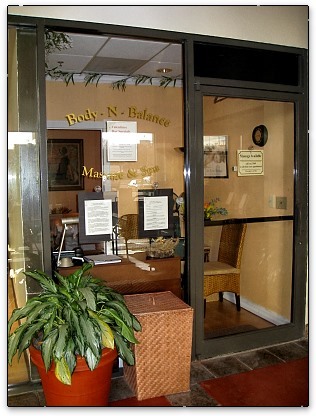 Clients can also select from Body-n-Balance’s specialties like their most popular treatment, Hot Stone Therapy (65 min. for $120, 95 min. for $160). Another choice is The Weary Traveler Body Treatment which includes a sea salt with cocoa butter oil scrub (65 min. for $140, or with a recommended Mini Massage for $195.00). In-room treatments run $145 plus a 20% gratuity. Massage chair sessions are also available and run $1.50 per minute. If you don’t see what you want on their menu, try a customized massage made to your specifications. Loyd and Monique planned just that for me – a 90-minute combination treatment of Swedish/relaxation massage with shiatsu – for my first treatment, custom-made just for me. How did they know?! My therapist, Julie, gave me a fabulous Swedish massage, checking with me a couple of times to make sure the pressure was just right: It always was. Good instincts. My favorite – and in my case the most needed – part of the treatment was the addition of the shiatsu work, which completely rebalanced my body’s energy (or chi). Julie treated the shiatsu points up and down my arms, legs, back, hands, feet, neck, head, and – at my request – tummy, working along the meridians – the lines that trace certain kinds of energy in the body, opening up these ‘pathways’. The perfect pressure at these points combined with the Swedish strokes allowed my muscles to relax, yet afterward I felt energized too. I actually felt my body quiver slightly when I got up, shake a bit for a few minutes, and ‘reorganize’ its energy flow. I have felt this before after certain types of bodywork, and know it is a healthy response; one of my circulation improving and my muscled and connective tissue shifting into place and out of tension. I felt fabulous – more so than in a long time. It only happens when I get an outstanding massage therapist doing an outstanding type of bodywork like meridian shiatsu. I would recommend this treatment to anyone, especially those who have been on a plane recently. My jetlag completely disappeared. My facial, the Sparkler (45 min. for $85), combined an exfoliant for the face followed by a revitalizing facial massage. It is described as providing “the very best in cleansing and moisturizing while rejuvenating facial muscles.” My therapist, Adriana, used an assortment of Burt’s Bees products in various citrus scents. She first applied a cool and gentle deep cleanser that didn’t burn or irritate even my sensitive skin, followed by an exfoliant, masque and deep conditioner. All of the products were applied using Swedish and deep tissue massage techniques. (Remember that real deep tissue does not mean pressing harder, it means knowing how to get to the deeper muscles in the body without necessarily pushing harder. Adriana was able to reach the deeper facial and neck muscles in my jaw without pain.) She also included a lovely décolleté and shoulder massage that left me purring like a cat. Another extra touch was the application of warm towels on my feet. I truly appreciated this, as I almost constantly have chilly feet. Afterward my shoulders and neck were relaxed and my sinuses were cleared thanks to her massage. My face felt fresh, moisturized and deeply cleansed, and looked fresh and healthy, too. My last treatment was the Manager’s Special (65 min. for $95.00), a relaxing massage combining deep tissue and Swedish massage strokes. It is described as including coconut lime and shea butter applied with a warm stone or the hands. My therapist, Carsten, used alternative scents including citrus, honey, carrot and eucalyptus. This was an excellent relaxation massage. The application of the oils with a hot/warm stone using long smooth strokes (reminiscent of a Lomi Lomi) topped this superb treatment. It made it unique, too. I felt truly fabulous and relaxed. This was a truly excellent deep tissue treatment. Carsten knew how to get to the deeper muscles without using a lot of brute force: Granted, I can take a lot of force, but it’s not good for the body. The knowledgeable Body-n-Balance staff to whom I spoke – many of whom have twice the 500 training hours required in Texas –were quick to praise the spa and its owners. One even said that working for Loyd and Monique was “a dream come true.” Now that’s an endorsement. As with the spa itself, the welcome at the Omni Hotel is polite and friendly, never stuffy. Also as with the spa, their philosophy includes “exceeding guests’ expectations.” Even with 23,000 square feet of meeting space for conferences, parties, etc., and 326 gorgeous rooms including a fabulous kid’s/family suite, the atmosphere is never one of being in a place so large you’re not important. The staff treats everyone like a V.I.P. I have since learned that the hotel shuttle makes regular trips to shopping malls, theme parks, and the downtown area including the gorgeous San Antonio River Walk that winds around many of the boutiques, art galleries, nightclubs, and other attractions. An IMAX and movie theater are a short drive away, as are two golf courses. Bike trails, mountain biking, camping and hiking are also within a reasonable distance. Although it’s an elegant and relaxing place for adult travelers, families are welcomed with open arms. Being near Sea World and Six Flags certainly does increase kid-appeal. But the Omni has made the hotel a family’s home-away-from-home beginning with a kid’s backpack for every child. The shallow end of the indoor pool is equipped with floating playthings – with which I saw more adults playing than kids. The kids’ suite is a brainstorm. 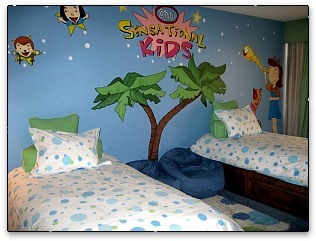 The parents enjoy the standard luxury room with their own bathroom, but through a connecting door you find the wildly painted kids’ bedroom with beanbag chairs, kid-size furnishings, two twin beds, a kid’s desk with crayons and paper, games, video games, and a large flat screen wall television set to – what else – the Cartoon Network. The closet includes child-size versions of the Omni’s robes. The kids’ bathroom has a fish bathmat, colorful shower curtain, and a stool on which little ones can stand while they brush their teeth. The Omni is also dog friendly, so bring the whole family. General Manager Cesar Cantor is proud of his excellent staff, and he has every right to be so. The hotel has been repeatedly ranked in the top ten Omni hotels, and last year it came in first place. Regarding the spa moving in only 18 months ago, Cantor said, “They have been very quick to adapt to the needs of the business traveler, the leisure traveler, and the group attendees.” The spa is also as family-friendly as the hotel: offering couple’s massages could mean and mother/daughter or father/son massage, or a package for tired parents on holiday. The outdoor areas are indeed as carefully tended as the indoor ones. 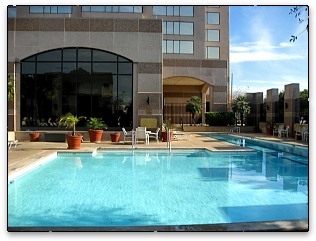 The outdoor pool includes a lap pool, standard pool, and a beautiful plant-festooned deck area with comfy chairs. In the front of the building, there is a lovely fountain and landscaping for the eye, not to mention top-drawer service with a warm genuine smile for the heart. Not a bad way to arrive after a long trip. The indoors is indeed a feast for the senses. Almost every public area of the hotel has a scenting device. (True confession: I ran from venue to venue, sniffing.) The lady’s locker room next to the indoor pool smells subtly like a floral garden, and light citrus scents create a wonderful atmosphere throughout much of the rest of the hotel. There were flowers in my room, the toiletries in the bathroom were never over-scented but were just right, and a scented garland hung from my shower head by a pretty ribbon. Even the newspaper outside of my door had a cinnamon-scented sticker on it. 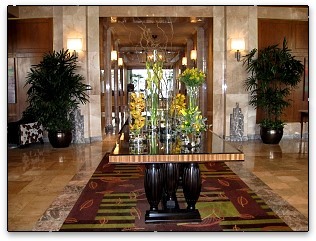 The eye is entertained with interesting furnishings and décor, including magnificent floral arrangements on a table in the lobby. As with the rest of the Omni staff, the florists who dress it weekly are encouraged to be creative and stretch their imaginations. The week I was there the display was an amazing combination of tall glass cylinders and big orchids in every shade of yellow imaginable. One employee told me that the florists made a giant floral snowman at Christmas. In the rooms there is a nice assortment of reading material, the electric wires are covered with pretty ‘wire-cozies’ (my term), and the morning cleaning service and evening turn-down service set your television to a channel that plays instrumental music and a slide show of gorgeous landscapes. I allowed myself to fall asleep to it that night. My room was decorated in soft sage, warm earth tones and wood, and the view from the 18th floor was amazing. The Omni actually chose a location with no tall buildings surrounding it so they would have the views. “The minute you see the building from a distance… you get an impression,” explained Cantor. When I commented that the hotel was beautifully decorated but not cluttered or pretentious, Cantor smiled and said that the goal for the décor is “luxury that is surprisingly sensible.” They’ve definitely achieved it. The volume on the three big flat-screen televisions in the Lobby Bar are turned down a bit to avoid disturbing chatting guests, but each has an oasis of big chairs into where guests can easily hear their favorite sporting events or news programs. Another feature I noticed immediately in the Lobby Bar is that the floor behind the bar in sunken, so the bartender is actually able to see eye-to-eye with his or her customers who don’t have to perch on barstools, but sit on comfortably padded chairs. Touch includes attention to the comfort of the furniture in the rooms and public areas of the hotel. Touch begins on arrival with a warm handshake if you wish from the doorman, and continues throughout the hotel. It includes soft high-quality towels and linens, easy to use temperature controls in each room, a multitude of toiletries from a variety of companies including Champagne-scented Bath Bloomers oil lotion and bubbling bath salts, and elegant scented soaps that are appropriately scented for men as well as women. It also includes a lovely hot tub and heated indoor pool, complete with aqua basketball for the kids at the shallow end. The ear hears soft music playing everywhere. In any public area you might hear a selection of jazz, baroque, classical-Viennese, or even world music selections. As previously mentioned, the guest room televisions are set to a channel with soft music as well as the beautiful vistas, so you are immediately welcomed ‘home’. An example of the hotel’s attention to detail: The kids’ backpack is a microcosm of the Five Senses theme. It includes a kaleidoscope, orange-scented wristband, a kazoo, a set of jacks with ball, cookies, and translucent gummy worms with little lighting tweezers that make them glow. Bolo’s Latin American Grille is conveniently located on the first floor of the hotel, as are the bar, pools, spa, and fitness room. It features a diverse menu ranging from staples like succulent steaks and burgers, to creative combinations of salads and healthy dining choices like grilled fish. The wine list is extensive and impressive. There is a good-size breakfast buffet Mondays through Thursdays. The lunch menu includes salads like the Portobello mushroom fajita salad ($11.00), the Hill Country steak sandwich ($12.50), and the Texas lump crab cake sandwich ($10.75). Dinner entrees include grilled Chilean sea bass ($24.95), stuffed chicken breast Florentine ($21.95), and a lovely filet mignon in 8-oz and 12-oz sizes. I had the smaller filet, but it didn’t last long. It was juicy and still well-done, the way I like it. For a healthy dessert or snack try the upside-down berry martini, a pyramid of fruit including Mandarin oranges, kiwi, strawberries, blackberries, raspberries, and blueberries under a large martini glass. 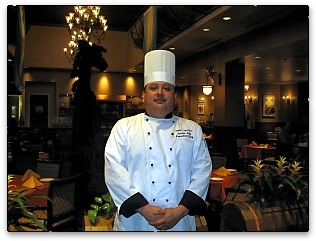 Bolo’s executive chef Javier Soto has been serving Omni guests for 11 years, and loves the creative freedom he receives from the hotel’s management. He is always coming up with new dishes. In fact, the best kept secret is an entree created especially for a member of the Omni staff who requested a low-cal meal. Not on the menu but available upon request, ‘Pam’s Plate’ consists of a perfectly grilled salmon steak and asparagus side. ($15.95) My salmon was absolutely wonderful, and I was very full afterward. Bolo’s serves breakfast from 6 a.m. until 11 a.m., lunch from 11 a.m. until 2 p.m., and dinner from 6 p.m. until 10 p.m. The Lobby Bar offers a nice menu of treats, some of which are also available in the restaurant, and all of which are available through room service. Nachos, paninis, and burgers run a very reasonable $9 to $12. Their quesadillas are fantastic – the perfect lunch or large snack. The presentation was beautiful with guacamole, sour cream and salsa served in a little red tortilla bowl. The house specialty drink is a signature margarita called Las Canarias. I did not have the pleasure of trying it, but I heard from other guests that it alone is well worth the trip to San Antonio. 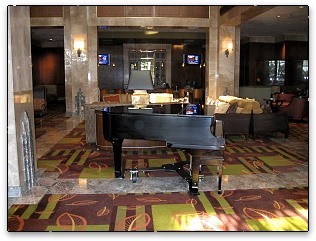 Live piano music entertains guests on weekday evenings. The Lobby Bar staff are also happy to serve you your drink order at poolside in the sun or in your room. Open from 3 p.m. until 1 a.m. If you’re opting for room service meals, you’ll find a full menu and kids’ menu, and speedy service from staff very eager to please. The Healthy Start Breakfast ($9.00) is certainly healthier fare than the tempting bacon and eggs extravaganzas on the menu, but be prepared to eat a lot of it. You receive your choice of juice; milk or soy milk; granola, muesli or oatmeal; yogurt; and coffee or tea. Service runs from 6 a.m. until midnight. I am very picky about the way my coffee is brewed, which is why I seldom drink it away from home, and seldom take the time to make it when I am home. But I couldn’t get enough of the San Antonio Omni’s room service coffee. Splendid stuff! You have a choice of milk, soy milk or half-n-half, but my descent into sin manifested itself in the enjoyment of a superb and very rich cream in my coffee: la crème de la crème. 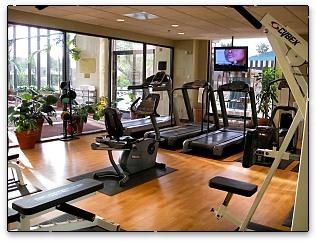 Even after the healthier dining options, the portions were so generous I felt it necessary to spend an hour in the fitness center each night – and what a great place to spend an hour. With juice bar or fresh apples, fluffy towels, television, private music with free ear-buds at each machine, and spring water, it hardly seemed like work. 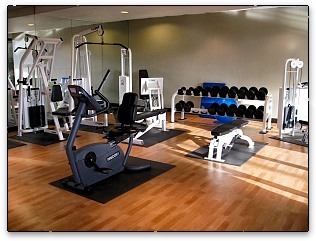 There is a nice selection of equipment including treadmills, ellipticals, a stationary bike, weight machines and free weights. 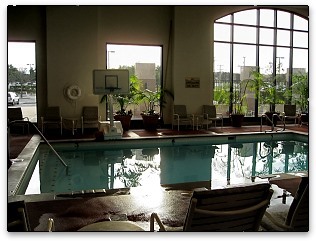 The hours for the fitness center and indoor pool are exceptional; 5 a.m. to 1 a.m. Need I say that San Antonio is hot and sunny in the summer, so bring your sunscreen, sunglasses and broad-brimmed hats. Within a block (and safely walk-able) is a little shopping area with two sushi bars, a famous cake shop with single slices and cupcakes as well as a dazzling assortment of ready to go cakes and teetering art-cakes, and a Starbucks. Across the street from the shopping area is a large supermarket (a HEB for those of you familiar with the chain) that can supplement your room service with baby food, toiletries and some drugstore items, greetings cards and gifts, and – for your quadruped pal – pet food and pet toiletries. They also sell a nice selection of floral arrangements including – of course – yellow roses. or email Body-n-Balance at prosperity1@satx.rr.com.